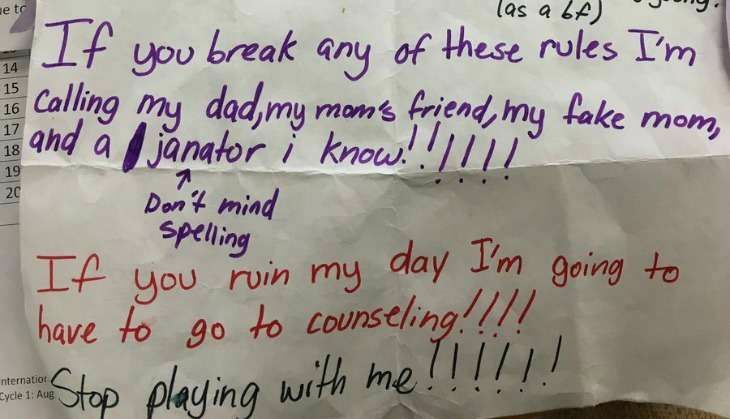 In the last couple of days it is quite possible that you came across a viral story of a fifth grader's list of rules for an over-enthusiastic admirer/classmate. It is also possible that you guffawed. But why is a behavior we abhor in adults, supposedly hilarious in kids? How in the world are they to ever learn the meaning of consent, then? This fifth grader's case came to light when her teacher took a photo of the 'list of rules' and sent it to her friends. Presumably for LOLs. Her friend posted the photo on Twitter and it received over 7k retweets and hundreds of comments. But thankfully, most of those who commented while awed at how clearly and firmly Zoe expressed herself, could see this for what it was: an act of overruling consent. It is when kids like Noah and Zoe are young that the boundaries of consent need to be mapped out and explained. That society doesn't lead by example is a given, but does that mean we neglect the basics of raising our own kids? It is imperative to teach them that no means no. That rejection needs to be taken into stride, and moved on. That even as kids, while playing, consent is key. That when a girl says no, she is not trying to 'play hard to get'. That just because you like somebody, they are not obliged to like you back.